Happy New Year's Eve!! Do you have any big plans? We don't. Our tradition is to get Chinese take out and watch some movies. It should be interesting to see how long I last. The last few days I have been in bed at 8 o'clock. Nights have been a little rough with lots of waking up throughout the night. Lately by 5 am I am wide awake and so uncomfortable I just end up getting out of bed. I get hungry not too long after getting up so I grab a small bowl of cereal. My only veggie intake has been my green smoothies packed full of spinach. This is my second breakfast right before I leave for work. I have another snack around 10:30 or 11 to hold me over till lunch. We still have some local apples available and they seem to be just the right amount of food. Overall all I would still describe my eating habits like a two year old. Here I had leftover mac and cheese and a hot dog. This was actually a bit too much food at once. I totally enjoyed the hot dog though. Mr. J however was disappointed it wasn't a Ball Park Frank; he didn't care for my pregnancy hot dogs. Dinner was actually kind of a big deal. It was a meal, planned out in advanced with toppings. Of course this came with a "you must follow the recipe exactly" to Mr. J so he wouldn't add too many extra hot peppers or spices. No hot foods for me nowadays. Honestly 2014 has been quite a year. We spent time with my brother and his family in Washington DC both in March and July and they came for a visit to Connecticut in September. Mr. J and I were able to go to Atlanta for a long weekend and go on a babymoon to Miami. We got a new front door and painted it yellow. We also got new windows, took off the old shutters and removed all of our front plants. Work was busy but we were both highly successful in our positions. And biggest of all we decided to add a new addition to our family. We will become three come March 2015. These changes led to less posting in 2014 but I am OK with that change. That difference didn't lead to a lack of yummy dishes coming out of the kitchen. Here are some of my favorites from 2014. It was Christmas and then it was done. It is crazy that Christmas came and went. We are officially three days away from 2015. We had a fun but packed few days in Maine. They left me exhausted. And now we have piles of presents to put away. A good problem if I do say so myself. To help motivate me a bit I made some banana bread. 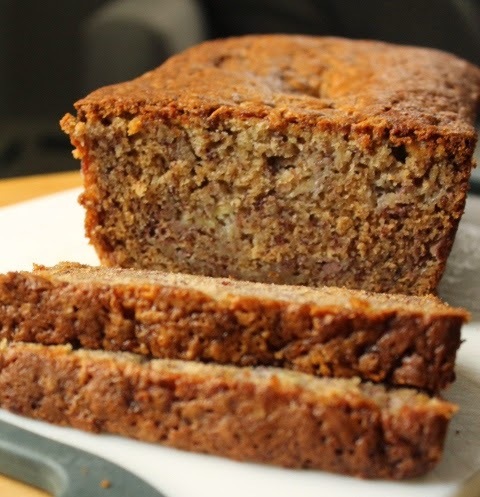 I am a huge fan of banana bread but this recipe is extra special. This banana bread recipe is amazing. I can see why in the cookbook it is called Flour's Famous Banana Bread. Maybe it is the oil? I am not sure but this by far the BEST banana bread I have ever made/tasted/eaten. It is super moist and packed with banana flavor. Sweet but not too sweet. This recipe might just have to be my new go to banana bread recipe. Sorry mom! Set oven to 350 degrees F. Grease a 9X5 loaf pan with cooking spray. Sift together the flour, baking soda, cinnamon and salt. In the bowl of a stand mixer beat sugar and eggs with a whisk until light and fluffy, about 10 minutes. On low speed slowly add in oil. Add mashed bananas, sour cream, and vanilla until combined. Fold in dry ingredients. Pour into prepared loaf pan and bake for about 45 minutes to 1 hour. Merry, Merry Christmas from our family to yours! We hope you have a marvelous Christmas with lots of good eats and family time. We will be doing the same. Enjoying the last Christmas as a family of two. Are you ready for Christmas? Somehow every time I cross something off of my to do list Mr. J adds something else. We have had two or three things hanging over our heads for the last week. I am about ready to tear it up and call it quits. These cookies were one of the last things on my list to check off. I wanted to make some cookies for coworkers and neighbors before Christmas. Little did I know how good they would end up being. Mr. J is in love. He had four within 20 minutes of them coming out of the office. Needless to say I need to make another batch. Good thing they are easy. These cookies are thick and chewy, just the way I like them. They are sweet but not too sweet and the red and green M&Ms scream Christmas. They are sure to please all of the little and BIG kids out there. In the bowl of a stand mixer fitted with the paddle attachment, combine the butter, cream cheese, sugars, egg, vanilla, and beat on medium-high speed until well-creamed, light and fluffy, about 5 minutes. Stop, scrape down the sides of the bowl, and add the flour, cornstarch, baking soda, salt, and mix until just combined, about 1 minute. Add M&Ms and beat momentarily until just combined. Using a medium 2-inch cookie scoop, form heaping mounds. Place mounds on a large plate, flatten mounds slightly with your palm, cover with plastic wrap, and refrigerate for at least 2 hours before baking. Bake for 8 to 9 minutes, or until edges have set and tops are just beginning to set, even if slightly under cooked, pale and glossy in the center. Do not bake longer than 10 minutes as cookies will firm up as they cool. Allow cookies to cool on the baking sheet for 5 minutes before removing and transferring to a rack to finish cooling. Cookies will keep airtight at room temperature for up to 1 week, or in the freezer for up to 3 months. Cheesy pasta with bits of shrimp and savory bread crumbs. I had big plans of posting all sorts of cookies recipes this weekend. But Sunday we woke up to snow. This was one of those stay in your pajamas all day and do next to nothing kind of days. Nothing except make this mac and cheese. Cheese and carbs are still my go to meals. So far it is the only thing that hasn't upset my stomach. I feel super bad about not giving Mr. J more nutritious or varied foods when he is home so I decided to up the ante by adding shrimp. Lobster seemed a bit much for a regular old Sunday and I certainly was not up to cracking the lobster claws open. The one time we both got off the couch was to team up and whip this dish up. It didn't take long for him to handle the shrimp while I prepped the cheese. The whole thing came together very quick and easily. You would never guess it though when you begin eating. The shrimp elevates everything to something way more special than simple mac and cheese. And don't forget about the breadcrumbs. The butter and browned crumbs are key. In a large pot, bring water to a boil and add pasta, cooking according to the directions on the box. Drain well. In the meantime, heat milk in a small saucepan (do NOT boil). In a large skillet, melt 2 tbsp. of butter and add the flour. Cook over low heat for 2 minutes, stirring with a whisk. While you're still whisking, add the hot milk and cook for a minute or two more, until thickened and smooth. Remove from heat and add the Gruyere, cheddar, salt, and pepper. Add the cooked pasta, and shrimp. Stir well to coat everything with the cheese mixture. Place the entire mixture into a large pie dish or casserole dish. I used a 9" ruffled pie dish. Melt the remaining 2 tbsp. of butter with ½ cup of breadcrumbs. Sprinkle on the top of the mac and cheese and bake for 30-35 minutes until mixture is bubbly and the breadcrumbs are brown on top. Serve warm and store leftovers in an airtight container for up to 5 days. Tonight is an exciting night. For us it is the beginning of the holidays. Mr. J has been running non-stop for the last several weeks. And although it helped a lot that I am no longer traveling as of this week it was still lonely and stressful with him being so busy. So even though we both have to work tomorrow the fact that we are both home with no where to go makes everything seem so much better. Because of all the hectic schedules we have barely eaten dinner together in the last month let alone made dinner. This pasta dish was a rare occasion a few weeks ago when pasta was one of the only things appealing to my taste buds. The fact that the recipe has 3 types of meat was appealing to Mr. J's. As far as bolognese sauces this one comes together quickly. No need to stand over the stove for hours in the afternoon. Plus it is not a huge quantity either. We had two big servings for dinner and then enough for two lunch servings the next day. In my mind that is just the right amount of food. Pulse bread in a food processor until coarse crumbs measure 1/2 cup. Combine crumbs and milk in a bowl. Heat olive oil in a large skillet over medium-high heat. Add onion and carrot; sauté 8 minutes. Add garlic and tomato paste; sauté for 1 minute, stirring constantly. Add vinegar; cook for 30 seconds. Add oregano, salt, peppers, and beef; cook 7 minutes, stirring to crumble. Stir in breadcrumb mixture and tomatoes; bring to a boil. Reduce heat, and simmer for 6 minutes, stirring occasionally. The last few weeks have been a dozy. I do best when both my feet are firmly planted on the ground. Unfortunately I had work trips planned months ago during a time when I was unaware of what was to come. Motion sickness is a very bad thing when you travel. I had two flights two weeks in a row. Let's just say it did not go over well. Come 24 hours later, I start to feel better but that pretty much is half the week when you take to flights. Luckily this week I was able to cancel my trip and I am not planning on doing any more travel till this little baby is born. Not feeling well has lead me to really watch what I have been eating. When I am not doing great I try to eat but crackers are about all I can handle. Once I feel better though I am able to handle a lot more. Not that I get too daring. Yesterday I woke up early and was hungry. Hello cereal at 5 am. My second breakfast came around 7:30 with a green smoothie. I have been adding more PB each more to make sure I get my protein in. And yes, that is my belly sticking out over the counter. Bumping into things with my belly is now the story of my life. Another snack came around 11 am with an apple. Followed by a 12:30 lunch of leftover frozen pizza. My second serving of greens for the day. I am counting this as a win. Mr. J was out and I opted for an easy frozen mac and cheese dish. I think I eat mac and cheese most days of the week. With the exception of my green smoothie I think I eat like a two year old. Spicy food is completely out of the picture. I am wondering once my body realizes I am not traveling any more if I will be able to add a bit more variety to my diet. What is your favorite frozen meal? What did you eat Wednesday? Its that time of year again. One my my favorite things during the holidays right these years is the #fbcookieswap put on by Lindsay and Julie. Each November they organize hundreds of bloggers in a great worldwide cookie exchange. This year was a bit interesting for me trying to negotiate work travel, baby room updates, and nausea. By some miracle though I managed to wrap up and mail three boxes of cookies before Thanksgiving. I always try out a new recipe for this exchange. Its great fun searching for a unique Christmas cookie that is hopefully universally pleasing. The bad news is if it turns out amazing Mr. J has to watch with a growling stomach as I wrap up each and every one of those cookies for others. These cookies have all sorts of goodness in them. Mini chocolate chips, Peppermint JoJos (Trader Joe's version of Oreos) and candy canes. I cannot think of a more Christmas combination of sweet add ins. After a few munches on the two extra cookies off these cookies went. Over the last few weeks I have gotten a few shipments of cookies as well. One even came all the way from Hawaii complete with toffee, macadamia brittle and coffee. Funny enough, another package was filled with very similar cookies to the ones I made. Mr. J got his cookies after all. Thank you to Lindsay and Julie for putting this big event and to the marvelous bloggers who sent us cookies. Combine the cake mix, melted butter, egg, and extracts in a bowl of a stand mixer. Beat until a soft dough forms. Add the cream cheese and beat in gently until combined. Remove bowl from stand mixer. By hand stir in the candy cane pieces and chocolate chips first. Then gently stir in the cookie pieces by hand being careful not to break up the cookie more. Refrigerate dough for at least 30 minutes. 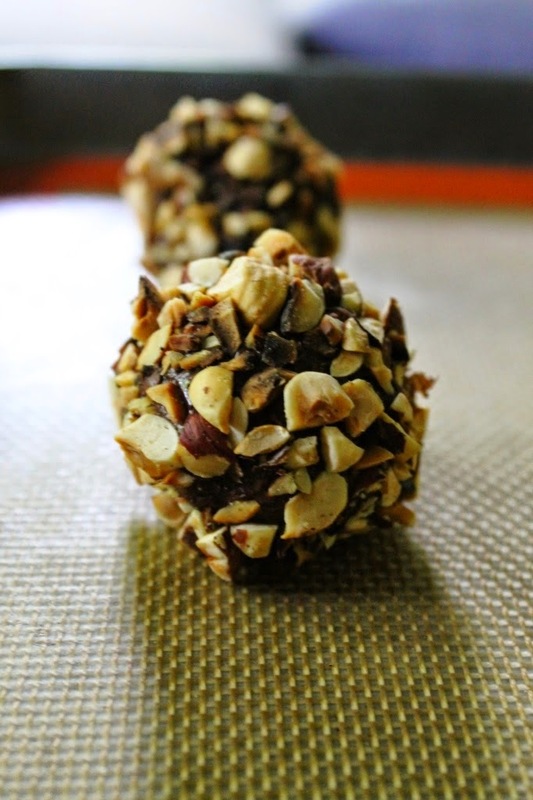 Roll the dough into 36 balls. Bake on a cookie sheet at 350 degrees for 9 minutes. Do not over bake. The cookies will be very soft and look undone. Let them sit on the hot cookie sheet for 2 minutes, then gently remove them with a spatula to a piece of wax paper on the counter. Very gently tap the tops of the cookies with the bottom of the spatula to even out the tops. Let them sit until completely cool. Store in a sealed container.